Each RomantiCraft template was designed with both US Letter and A4 Paper sizes in mind. 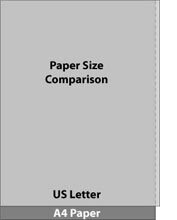 A4 paper is recognized throughout most of the world as the standard size for business documents. The size differences when printing are normally a challenge. A common solution has been to scale the document or to make two documents; one for each size. Both options are not ideal. RomantiCraft templates were designed using US Letter so that images would print perfectly on either US Letter or A4 paper without any scaling. Some paper crafts, like the playing card box, need to remain actual size to be functional. The US Letter format avoids having 2 download buttons and multiple reworking of templates for minor margin differences. Margins are not a priority in printing a paper craft as the rest of the paper will be scrapped once the pieces are cut. For simplicity, one size fits all. When printing a RomantiCraft Template on A4 paper, set Scale to None and print as if using US Letter paper. Do not change the printer paper size settings to A4. Once printed, the difference will be a longer margin at the bottom of the paper which will be discarded anyway. Set Quality to good or best. Color inks differ between printer manufacturers, however there are some settings within your printer software that can deepen black and adjust grey. You may need to experiment a little with some of the settings if some of the colors just don't match what's on the screen. The Paper type setting should be adjusted to heavy card stock or photo paper for best results. The recommended card stock is 110 lb white. Depending on where you live in the world, this heavy paper may have a different name and weight. Thick photo paper will work well and some colors may appear better printed on photo paper. Most printers allow a preset to be saved with specific settings so you'll be ready to print your next romantic craft with ease.